Pioneer Dodge car owner Cotton Owens is one of 25 candidates being considered for induction into the NASCAR Hall of Fame this week. 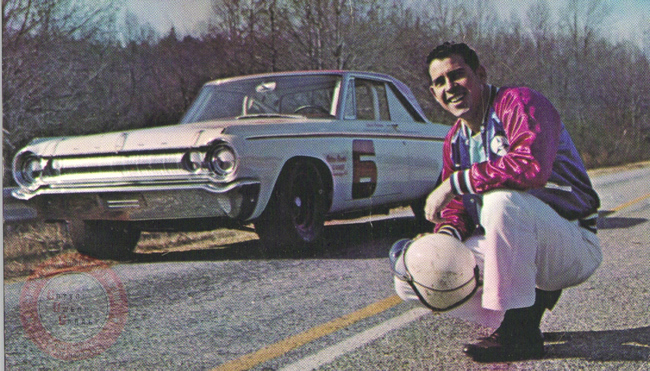 In 1966, the Spartanburg, S.C., native teamed with David Pearson to win what is now known as the Sprint Cup Series title. He claimed 38 Cup victories, 31 of which came with Dodge. Q: HOW DID YOU GET TOGETHER AND START DRIVING FOR COTTON OWENS? Pearson: Well, I’ve known Cotton for a long time. In fact, I always pulled for him before I ever started racing; he’s always been my hero. I’d go by his shop. I always liked him because he’s in my hometown right here. He doesn’t live far from me and, in fact, I go see him quite often now. Q: WHAT WAS YOUR BIGGEST CHALLENGE BACK THEN? WAS IT PARTS? Pearson: The Dodge people were the best people I’ve ever worked for, if you want to know the truth. Anything we needed, we got it. We’d tell ‘em we need this or need that and they would get it for us. They furnished us cars, whatever we needed and whatever we wanted. It seemed like they’d bend over backwards to help us and give us everything we needed. Q: HOW GOOD WAS COTTON OWENS AND DID YOU EVER RACE AGAINST HIM? Pearson: Well I run against him one time at Richmond. We were running what is now the Sprint Cup cars back then; we called ‘em Grand National. Anyway, I was leading the race and when it was time to pit, they told me to pit. I looked and here come Cotton in, so I had to sit and wait until they got through with Cotton’s stop before they could change my tires. When he went back out, he was in front of me and he ended up winning the dadgum race. He’s always kidded me about that – he’d tell everybody that he went up there on dirt and showed me how to drive (laughs). We’ve always had a good time. Q: WHAT WAS IT LIKE FOR YOU WHEN YOU HAD THE OPPORTUNITY TO DRIVE FOR COTTON OWENS? WHAT WAS THAT LIKE FOR YOU AND YOUR CAREER? Pearson: He ask if I wanted to run all the races and I said well sure, I’d like to run more races. So we run quite a few races that first year (1965) trying to get ready to run the next year, which we did. We run quite a few races and tested a lot while we were running. We changed the car a lot, just experimenting with different things while we were running. It paid off ‘cause the next year, when we run all the races, we won the championship. Q: WHAT WAS IT LIKE DRIVING FOR OWENS? Pearson: He was good. During the week I’d go over there and help work on the cars too. When they were building new ones, I did a lot of welding on the things. We got along well, we really did. I enjoyed working with him and driving for him. He never did do like some of the drivers say the owners do and try to tell ‘em how to drive and all that. He never said a word to me about what to do or how to drive. I drove it just the way I thought I could drive it and he was satisfied with it. Like I say, we got along good. At motels at night, we would wrestle. We’d do all kind of stuff. He wasn’t like a boss man or nothing like that. He was just like a friend and we enjoyed doing what we were doing together. Q: HOW BIG WAS IT WHEN YOU WON THE CHAMPIONSHIP? HOW BIG OF AN ACCOMPLISHMENT WAS THAT? Pearson: We set out to win the championship and we did it. That was a big accomplishment for us to do something like that, especially the first year that we really tried. It meant a lot to me, it really did. Q: WHAT WERE SOME OF THE HIGHLIGHTS FROM THAT SEASON? Pearson: I can’t really remember what all I did win there or how many I won that year (NOTE: he won 15 races). A lot of it was short tracks back then which we’d run good, extra good as far as that goes. Cotton was a good mechanic, too. He built the engines and everything. Every once in a while, he would stick something in there that I didn’t think had enough horsepower. “I remember running Greenville-Pickens one time. It was a dirt track and I told him ‘Cotton, this thing won’t run,’ And what happened, we broke the motor or something and he put a stock motor in the thing and I ended up winning the race with a stock motor. That was fun. Of course the track was muddy and we didn’t need much horsepower. It was really helping us more than it was hurting us because the car wouldn’t spin as much. Q: YOU MADE 42 STARTS THE YEAR YOU AND COTTON OWENS WON THE TITLE. WHAT WERE SOME OF THE CHALLENGES TO MAKE SURE YOU HAD A GREAT CAR EVERY WEEK? Pearson: A lot of times we’d run three races in one week. When we made the Northern Tour, we just run the same car and we would make any changes at the motel after each race. We’d go on to the next town that we were going to race in and we’d work on the car there at the motel. We’d change springs and things like that, whatever we thought was right. We run well about everywhere we went. “Cotton did all the work. He’d build motors, he’d build cars. He won the championship in the modifieds too I reckon. He did real well in everything he did. A lot of people don’t know he drove, took the cars to the racetrack, he built it, he’s done it all. He won a bunch of modified races and he won races as a car owner. He did a lot of stuff himself getting the car ready, things a lot of people hadn’t done. Anybody that deserves going into the Hall of Fame, he definitely needs to. I thought he might have gone in last year. I’d like to see him go in. I’d like to see him go in the Hall of Fame before anything happens to him. He needs to get in there right now. I think if he knew he was going in, something like that would help him a lot. Q: WHAT CAUSED YOU TO GO YOUR SEPARATE WAYS? Pearson: We’re just as close friends now and we didn’t get mad at each other. We were getting ready to go to Columbia (S.C.), to the race down there. He had the truck pulled outside (of the garage) and went home to take a shower. All of us were out there ready to go. We were running a little bit late so we just decided, me and the crew, we got in the car and took off to get some ice for the cooler so we wouldn’t have to when he come out. So when we went to get the ice, Cotton came out and he thought we run off and left him. He kind of got a little ill about that and he just pulled the race car and truck and everything back in the garage. So when we got back we thought he’d left us and we’d have to hurry up and go catch him. So we took off to Columbia and when we got there, there was no Cotton. He got mad and pulled his truck and stuff into the garage and we thought he had already gone. When we got back, we didn’t see no car or truck or nothing. He had pulled it back into the shop. We thought he run off and left us and he thought we had run off and left him. It all ended up on account of that bag of ice we went to pick up. “But the next morning I went up there and the boys were standing on the outside. I said ‘What are ya’ll doing standing out here?’ They said ‘He just fired us. He got mad, said we run off and left him last night.’ I couldn’t believe it and I went back in there and I said ‘What are you doing Cotton, getting mad at these boys and running them off. We thought that you run off and left us. We went to get ice.’ He said if you don’t like it you can go too. I said, well, I don’t like it so I just turned around and walked out. I told the boys when I went outside ‘Well, I’m gone too’ so that’s what we broke up about. Neither one of us was mad. He said that and when he said that, I didn’t like it. I lost a bunch of points. I didn’t race. Anyway, it worked out all right. “I wasn’t mad. I understood why he got mad ‘cause he thought we run off ad left him and later on, he felt the same way that I was. He wasn’t mad at me; he just didn’t understand what happened. We’re real close friends. In fact, I went to see him before the Darlington race. Before he got sick, I used to go by and pick him up every Sunday and take him to lunch after church. He’s a nice fella, he really is. Q: IT SEEMS LIKE YOU GUYS HAD A SMALL TEAM BACK THEN. HOW DIFFICULT WAS IT TO COMPETE? Pearson: We were a small organization, but you don’t need all those people like Hendrick and others have. They’ve got two or three hundred people working at the shop. I think we had probably six or eight people. That’s all we had at the shop. If you get any more than that, you probably get in each other’s way. Everybody knew what they had to do and they did it, whatever they had to do. We didn’t make a lot of money, as far as that goes, but it was enough to keep you going. Dodge paid him as well as I guess anybody else was getting as far as that goes. Cotton has always been fair; at least he has to me. We had a good bunch of boys, too. All of us were from around here and we enjoyed each other. We were always carrying on with a bunch of stuff. I always had something going on. “I remember one time we were up in Maryland running on a short track and I was leading the race and had a pretty good lead. And I looked and they (the crew) were over on the backstretch watching the race. They weren’t far from the pits. So I started cutting the switch off and on like it was skipping and they took off running to the pits. They knew I was coming in and I laughed when I went by because there wasn’t anything wrong with the car. We were always doing something like that. Q: WHAT WAS HIS TEMPERMENT LIKE AS AN OWNER? HOW DID THAT MESH WITH YOUR PERSONALITY? Pearson: He was more hyper, like a little ol’ banty rooster jumping around. He was always in a hurry to get something done. It was a lot of fun just working with him. He’s always been my hero, all the way back when he ran the modifieds. I’d go around looking to see what all they would do to the cars. There were a bunch of shops here in Spartanburg; Bud Moore was here and Jack Smith. At one time there were nine teams here in Spartanburg, so I’d go around to different teams and see what they were doing, trying to learn things for my own car. They were a lot of people that helped me, tell me about different things. I’d ask questions, especially when I was running my car and before I ever started with Cotton. I’d ask things about what made this work or what made that work. They were good to me and they would explain things to me. Q: WHAT WAS THE STRENGTH OF THE COTTON OWENS TEAM? Pearson: It was everything. We always run pretty good and always handled pretty good. We all just worked together. If I wanted to try something, I’d tell him and we’d try it. And if it didn’t work, we’d go back and do something else. We just worked well together.